One of the greatest pieces of architectural art ever created, the Statue of Liberty, is a testament to the cooperation between France and the United States; basically a huge symbol of friendship. The statue is a huge neoclassical sculpture located on Liberty Island in Manhattan, New York City. Designed by Auguste Bartholdi and completed in October 28, 1886, it depicts a robed woman known as Libertas, the Roman goddess of freedom. She holds a torch and a tabula ansata, which is a tablet that evokes law. Inscribed upon the tablet is the date July 4, 1776, which is the date on which the American Declaration of Independence was signed. A broken chain lies at her feet, which represents liberty breaking through the chains of oppression. 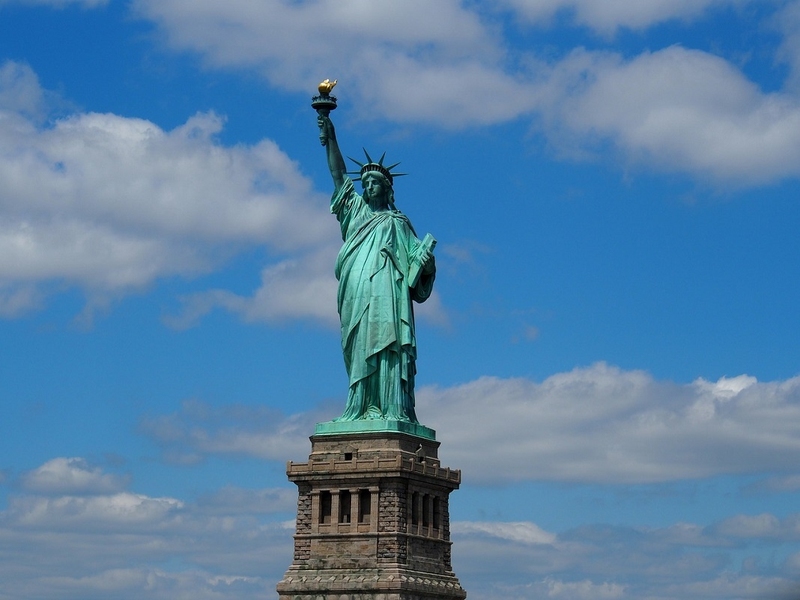 The statue is an icon of freedom for the United States, and was used as a welcoming signal to the immigrants who came to America from abroad in the early 20th century. The history of the Statue is well known, but this lady of liberty still keeps many fascinating secrets. Before the Statue of Liberty was actually called by her current name, she was originally known as "Liberty Enlightening the World". This name is actually what the designer, Auguste Bartholdi originally intended, and it can be directly translated in French. The name "Statue of Liberty" was adopted due to the fact that it was much easier to pronounce. The Statue of Liberty was given to the United States by the country of France. France wanted to send a type of condolence to the United States for being able to fight over oppression and turn into an amazing country, despite all odds. Auguste Bartholdi was inspired by a French law professor named Edouard Rene de Laboulaye, who made a comment that any monument raised towards American independence should be a joint project between the French and American peoples. In the mid-19th century, Napoleon III was currently ruling France, and Bartholdi wanted to avoid confrontation from the biased president. Work on the statue began in 1870. In 1875, Laboulaye made a statement that the French should finance the completion of the statue and that the Americans should find a proper site and build the pedestal upon which the Statue of Liberty would stand. The head and torch-bearing arm were completed first, and these pieces were available for public display at a variety of international expositions at the time. The Lady Liberty was actually constructed to resemble Charlotte Bartholdi, the designer's mother. At the feet of Lady Liberty are broken shackles, which are not able to be seen from the ground because of the height of the pedestal. These chains actually symbolize Lady Liberty's freedom from British oppression and control. The United States was originally founded as a group of British colonies, and the pilgrims who immigrated to America were in search of a place away from religious persecution. After years of fighting the British, the United States created the Declaration of Independence on July 4th, 1776. France had been both an ally and enemy during this time, and wanted to solidify a friendship by providing the Statue of Liberty. The Statue of Liberty was not always the color it is today. The copper that the exterior is made out of was originally shinier, and very similar to the characteristics of new copper. Over time and oxidation of the metal, copper eventually turns a greenish-blue hue. The United States Government decided not to renovate the statue by replacing the copper because it serves as a layer of protection against any more deterioration. One interesting fact about the Statue of Liberty is the thickness of the exterior layer of the copper. The thickness is the approximately the same thickness as putting 2 US pennies together, which is 2.38mm. The copper was originally intended as a way of protecting the entire statue, but the designer Bartholdi forgot to mention that he knew that the structure would eventually turn green. It took a total of 30 years for The Statue of Liberty to change from brown to green. Liberty Island is subject to the wind and bad conditions that the Atlantic Ocean brings in. Despite these harsh weather conditions, the copper protecting the statue has only weathered about 0.005 of an inch, which is lesser than the width of a penny. In the year 1906, U.S. congress originally thought that the changing colors of the Statue of Liberty were a sign of deterioration. There was a vote enabled to spend $62,000 in order to give the statue a new coat of varnish. Eventually, due to the designer's response that the oxidation of the copper was a part of the design, the bill was not passed. The Statue of Liberty contains over 62,000 pounds of copper used for the construction of the statue. We didn't even know that there were 300 different types of hammers. This is the amount that was used to shape the copper to conform around the body of the statue. After the bombing attacks on the World Trade Center and the Pentagon in 2001, the statue remained closed to visitors for over three years. This was due to the possibility of further terrorist attacks, with the Statue of Liberty being a prime target for these terrorists. The Statue opened up again for public viewing August 3rd, 2004. What many people don't know about the Statue of Liberty is that the torch being displayed now is not the original one. The Lady of Liberty actually has three arms. The first torch was removed due to a water leakage and can be viewed on display within the monument's own museum. Server responsed at: 04/22/2019 8:43 p.m.